The road to achieving my lifelong dream of becoming a teacher was filled with many unexpected twists, turns, and bumps along the way. I never varied from that dream which I first began to consider when I was a young boy living with my uncle in the village of Chinameca in the department of San Miguel. I was born on February 21, 1933. At age twelve when my mother died, I needed to move in with my uncle. We lived in misery. He was a poor man working in agriculture growing sugar cane, corn, and beans. He taught me what he knew about raising those crops as well as how to milk cows. There I attended school through the third grade and had a teacher I very much admired whom we nicknamed, Chico cola de vaca “tail of a cow.” I related well to his methods of teaching and soon realized, even as a child, that this is what I wanted to become when I grew up. Because of our extreme poverty I needed to help provide financial support, so when I was young, I would pick coffee beans during the harvest. Later I worked in a coffee factory in San Miguel. At age 13 my friend, Manuel Ochoa, taught me how to make shoes. When it became necessary for him to move into San Salvador, I moved with him where he continued to serve as my mentor. I worked in the shoe store with him for three months. In 1953 I became part of the organized shoe union, De Zapateros. When I was 24, a friend of his recognized my spark for teaching and recommended that I continue my studies. It didn’t take much convincing for me to move to Santa Tecla, where I began the equivalent of fourth grade through sixth grade studies. At that point some of my friends and I attended Marcelino Garcia Flamengo School at night to study “basic plan,” through the ninth grade in order to be able to continue to work during the day to subsidize our living situations. Again the teacher asked me, “Why don’t YOU consider being a teacher?” I responded, “This has always been my wish.” As a result of his encouragement, my next step toward achieving my goal was to study for five years to earn a degree in teaching. 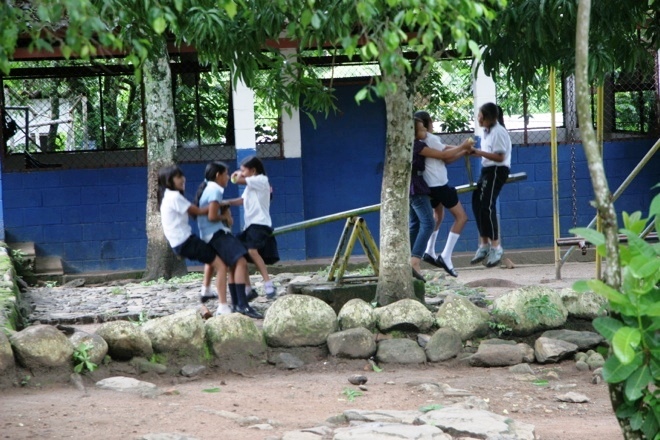 That study took place in Damian Villa Corta High School in Santa Tecla. In the village of Rural Mixto Canton El Triunfo near Santa Tecla, there was no existing building. We held school in a rented house. At this point I worked cooperatively with an administrator in that area to build a school. We named the school Narciso Rodezno School after its director because he had an intense and abiding love for children and had none of his own yet was devoted to them and donated the land to build this school. This was my first teaching assignment, and I taught all subjects to elementary-aged children. I earned barely enough salary to support my wife and my three children. It was not a dignified life. Yet I had completed my dream of teaching which I enjoyed very much. My career was commencing on target until our country’s civil war abruptly took hold and everything changed. That is when my career began to reach some unexpected twists and turns around the years 1979 and 1980. I had moved to another school at the Finca Florencia School where my role was that of sub-director and was also active in its teachers’ organization called ‘ANDES.’ The military perceived educated persons, especially those who showed interest in organized leadership roles such as myself, as a threat and began making persecutions against me in the form of death threats. Joining the guerrilla movement was the only option to save my life. My teaching did not come to a close even during this time, however. We founded a guerrilla school where I taught reading and writing to the troops. My official title was “political commander” with my job being to collect information and give it to the troops. I served in San Vicente in the Chalatenango department and was later transferred to Morazan for another year. Then I returned to San Vicente. In total I was in the guerrilla movement and away from my family for the majority of the war – from 1980 to 1990. During the time I was working in the guerrilla movement, my family remained behind. A paramilitary unit of the National Police captured my daughter, Blanca, detaining her for 15 days. She was not physically tortured; however, she was psychologically traumatized. Our neighbors mobilized the human rights groups and were able to get her released. After the 1992 Peace Accords five organizations of the FMLN began to found different communities for the returning refugees from the war. Our responsibility in founding those communities was to help purchase the land to re-settle the displaced persons returning from exile from the war. Then we needed to organize and implement the management of the re-building. The communities were mainly designated for former guerrilla fighters, Lutheran refugee camp persons from San Salvador’s Fe y Esperanza (Faith and Hope), those from the Mesa Grande Refugee Camp (across the border in Honduras), as well as persecuted persons from Sonsonate and comprised twenty-seven families each. We founded Las Minas, a canton in Chalatenango. Later I was sent to establish other communities including Celina Ramos and this one here at Guillermo Ungo on November 21, 1991. 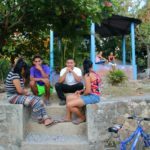 With friends we established the communities of Los Enriquez, Montepeque, Loma Chata, Huerte Enana, El Sitio Nuevo, which is designated for veterans from Nicaragua, and then the Monsignor Romero community. The Communist party of which I have been a part, helped provide us with information in how to obtain food. Another big priority was always establishing education within these communities. In each community we worked with the owner of the land as well as the banks to negotiate according to the quantity of land. They gave enough land to each family to build a house, cultivate a garden for their own crops, and have animals, as well as have collective parcels of land for the community to grow larger crops such as corn and beans. After the Peace Accords were signed, each guerrilla was required to attend six months of training, resulting in 60,000 colones pay. I purchased six manzanas (about 1.6 acres of land) costing 33,000 colones (about $5,000) in El Salitre, a mountain community which is a forty- minute walk north of Huerte Enana. Forty families live there, and there is no school. A child was raped on the long walk to school one day. The minister of education was contacted to request help in building a school in that community to avoid further student assaults on the lengthy walk to and from school. Nothing ever came of their request. One of the founding members of the community approached me asking if I would consider funding a school in that location. I agreed to do so. My ultimate goal is to donate the land to the United Nations with the understanding that it be recognized as Patrimonial, a place for humanity. The downside of watching this process over the years has been that many families simply cannot pay back the bank loans and find they must sell off a parcel of the land. The result is they can grow only enough for their immediate needs and not enough to sell. Even when they do try to continue to work in the agricultural field, they are needing to buy their seeds high and sell their harvest low. The price they get often does not cover their initial cost; thus there is no profit margin. Therefore, these families continue to live at a subsistence level and are losing motivation for all the hard work. The climate changes are also negatively impacting agriculture as the seasons become more unpredictable. My biggest disappointment has been that our government has not really changed peoples’ lives for the better. There is more hunger, more misery, fewer jobs, and very low salaries such as $5 a day. Goods are becoming more expensive to purchase, and yet the salaries do not increase at the same pace. On the positive side, my biggest joy is that God has given me life to serve my people. I was raised as a Roman Catholic; taking my First Communion as a child and listening to Archbishop Romero’s homilies in the cathedral had a big impact on me. My belief is that God is a spirit that lives within each of us if we are good persons. Slowly, slowly we have to learn to feel God within us. There is no chapel within our community here because different families belong to different religions. (In the Monsignor Romero community, however, they do have a chapel.) There is a bus that takes people into town to church every Sunday, and it is always very full. My dream is to continue to serve and help the people here in this community. Faith in God always motivates me to continue. I teach as I can. Although the gangs have been trying to infiltrate and organize even in our rural setting, so far at least, we have been successful in preventing that from happening. In the cities that is a major issue. I hope we can continue to teach the youth a good educational and spiritual formation. An immediate need we are hoping to meet if we can find a funding source is building a big soccer field for our large number of youth to give them positive ways to use their energy and teach them skills. I have nine children, some of whom live here in El Salvador and others live in the U.S. I have many nieces and nephews who consider me their father. I hope that some day our country will have a good economic system whereby its youth will not feel the need to emigrate to the U.S. If I were choosing a career over again, yes, I would without a doubt, choose teaching. Teaching is the profession that is more connected to the interests of humanity and interests of the people than any other. The most important thing I wish to share with the world is that we are a people of love. We can’t hate one another. 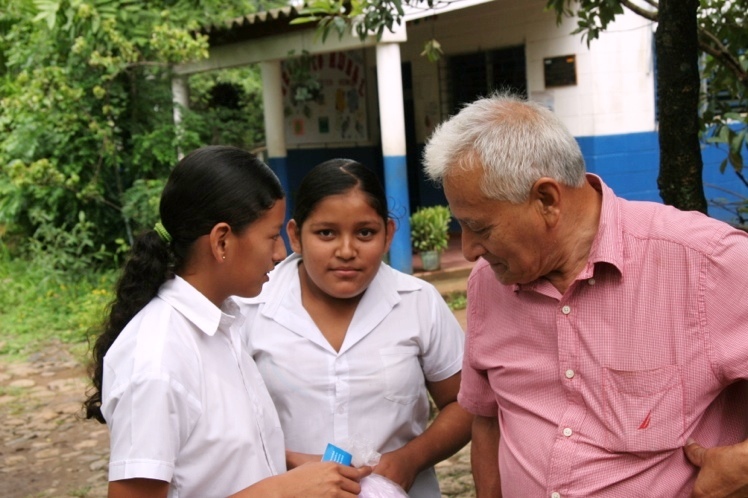 Editor’s Note: Don Fito continues to live and serve in Guillermo Ungo, which is located a few miles south of Suchitoto. 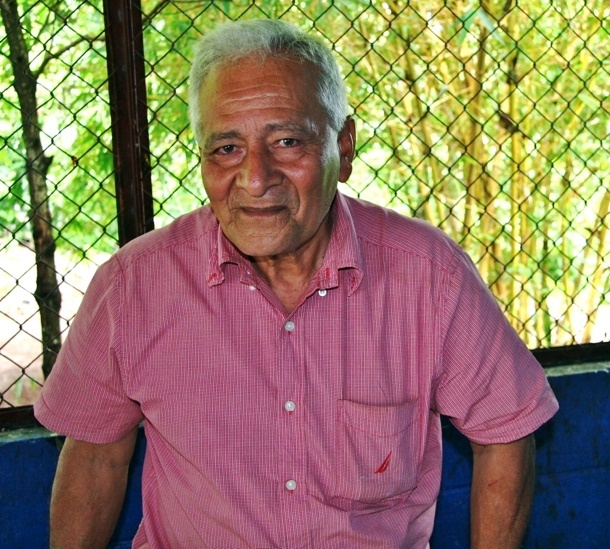 It was once part of a large plantation which its owners eventually relented to selling under a cash-and-credit agreement under the 1992 Peace Accords which were brokered by the U.N. Don Fito has officially retired from his role as school director/principal but remains committed to overseeing projects that will benefit that community at large. Examples he oversees include obtaining school materials and computers for the school, helping with the scholarship program, and obtaining galvanized pipe for the community water supply. He plays a vital role on the community’s scholarship committee which involves helping to select students with potential, good grades, and positive attitudes and work ethic. He manages and budgets money frugally trying to get as many students into this program as possible. This story was shared with us about Don Fito: In 2010 at age 78, he was at the front of a march on human rights and climate change in downtown San Salvador. As the marchers approached the presidential palace, the police were lined up in their riot gear anticipating provocation. Don Fito stopped the group, calmly turned them around instructing them to march backwards. Then totally composed, yet in control using his soft-spoken voice of authority, he spoke to the police, “This is for YOU, too.” Soon the marchers and riot police were all joining together in snacks and coffee. What could have been a confrontational event turned into an event of solidarity thanks to the insight of Don Fito’s reversing the group and welcoming all to join together in common cause. It is with gratitude we acknowledge Ruth Cruddas of Watsonville, California, who suggested we meet and interview this humble man, Don Fito.